App Transport Security (ATS) enforces secure connections between internet resources (such as the app's back-end server) and your app. This article will introduce the security changes that App Transport Security enforces on an iOS 9 app and what this means for your Xamarin.iOS projects, it will cover the ATS configuration options and it will cover how to opt-out of ATS ATS if required. Because ATS is enabled by default, any non-secure internet connections will raise an exception in iOS 9 apps (unless you've explicitly allowed it). As stated above, ATS ensures that all internet communications in iOS 9 and OS X El Capitan conform to secure connection best practices, thereby preventing accidental disclosure of sensitive information either directly through your app or a library that it is consuming. For existing apps, implement the HTTPS protocol whenever possible. For new Xamarin.iOS apps, you should use HTTPS exclusively when communicating with internet resources. Additionally, high-level API communication must be encrypted using TLS version 1.2 with forward secrecy. 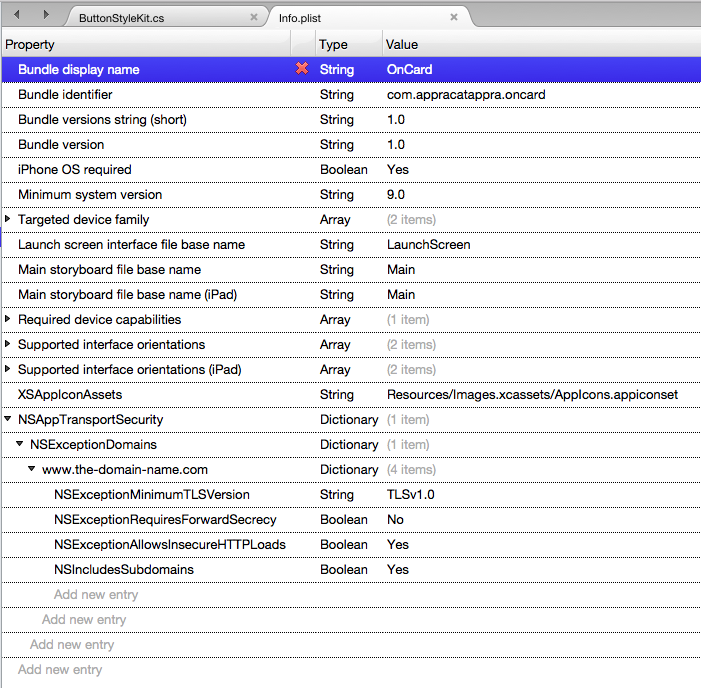 Any connection made with NSUrlConnection, CFUrl or NSUrlSession will use ATS by default in apps built for iOS 9 and OS X 10.11 (El Capitan). Since ATS is enabled by default in apps built for iOS 9 and OS X 10.11 (El Capitan), all connections using NSUrlConnection, CFUrl or NSUrlSession will be subject to ATS security requirements. If your connections do not meet these requirement, they will fail with an exception. All connection ciphers must be using forward secrecy. See the list of accepted ciphers below. The Transport Layer Security (TLS) protocol must be version 1.2 or greater. At least a SHA256 fingerprint with either a 2048 bit or greater RSA key, or a 256 bit or greater Elliptic-Curve (ECC) key must be used for all certificates. Again, since ATS is enabled by default in iOS 9, any attempt to make a connection that doesn't meet these requirements will result in an exception being thrown. For more information about working with iOS internet communication classes, please see Apple's NSURLConnection Class Reference, CFURL Reference or NSURLSession Class Reference. Because ATS is enabled by default in iOS 9 and OS X El Capitan, if your Xamarin.iOS app or any library or service it is using makes connection to the internet, you'll need to take some action or your connections will result in an exception being thrown. For an existing app, Apple suggests you support the HTTPS protocol as soon as possible. If you either can't because you are connecting to a 3rd party web service that doesn't support HTTPS or if supporting HTTPS would be impractical, you can opt-out of ATS. See the Opting-Out of ATS section below for more details. For a new Xamarin.iOS app, you should use HTTPS exclusively when communicating with internet resources. Again, there might be situations (like using a 3rd party web service) where this isn't possible and you'll need to opt-out of ATS. Additionally, ATS enforces high-level API communication to be encrypted using TLS version 1.2 with forward secrecy. See the ATS Connection Requirements and ATS Compatible Ciphers sections above for more details. While you might not be familiar with TLS (Transport Layer Security) it is the successor to SSL (Secure Socket Layer) and provides a collection of cryptographic protocols to enforce security over network connections. The TLS level is controlled by the web service that you are consuming and is therefore outside of the app's control. Both the HttpClient and the ModernHttpClient should automatically use the highest level of TLS encryption supported by the server. Depending on the server that you are talking to (especially if it is a 3rd party service), you might need to disable forward secrecy or select a lower TLS level. See the Configuring ATS Options section below for more details. App Transport Security does not apply to Xamarin apps using Managed HTTPClient implementations. It applies to connections using CFNetwork HTTPClient implementations or NSURLSession HTTPClient implementations only. The Managed handler is the fully managed HttpClient handler that has been shipped with previous versions of Xamarin.iOS and is the default handler. It is the most compatible with Microsoft .NET and older version of Xamarin. It is not fully integrated with iOS (e.g it is limited to TLS 1.0). It is usually much slower than the native APIs. It requires more managed code and creates larger apps. The CFNetwork based handler is based on the native CFNetwork framework. Uses native API for better performance and smaller executable sizes. Adds support for newer standards such as TLS 1.2. Some HttpClient features and options are not available. The NSUrlSession based handler is based on the native NSUrlSession API. App Transport Security has blocked a cleartext HTTP (http://www.-the-blocked-domain.com) resource load since it is insecure. 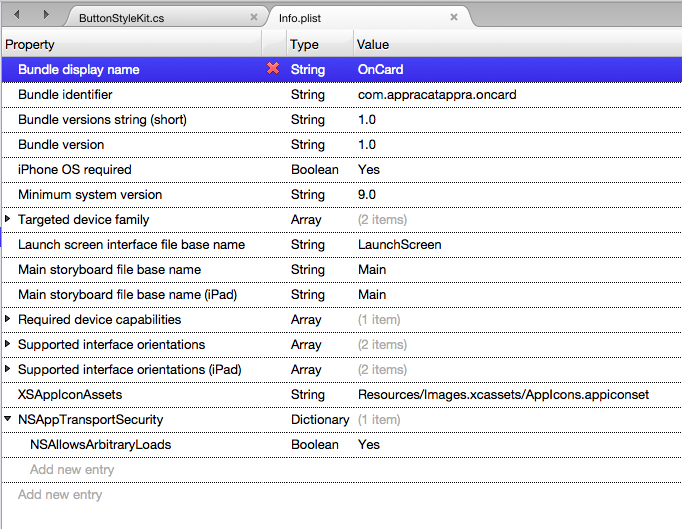 Temporary exceptions can be configured via your app's Info.plist file. In iOS9, App Transport Security (ATS) enforces secure connections between internet resources (such as the app's back-end server) and your app. Additionally, ATS requires communication using the HTTPS protocol and high-level API communication to be encrypted using TLS version 1.2 with forward secrecy. Apple also provides the TLSTool Sample App that can be compiled (or optionally transcoded to Xamarin and C#) and used to diagnose ATS/TLS issues. Please see the Opting-Out of ATS section below for information on how to solve this issue. NSAppTransportSecurity (Dictionary) - Contains all of the setting keys and values for ATS. NSAllowsArbitraryLoads (Boolean) - If YES ATS will be disabled for any domain not listed in NSExceptionDomains. For listed domains, the security settings specified will be used. NSAllowsArbitraryLoadsInWebContent (Boolean) - If YES will allow web pages to load correctly while Apple Transport Security (ATS) protection is still enabled for the rest of the app. NSExceptionDomains (Dictionary) - A collection of domains that and the security settings that ATS should use for a given domain. (Dictionary) - A collection of exceptions for a given domain (eg. www.xamarin.com). NSExceptionMinimumTLSVersion (String) - The minimal TLS version as either TLSv1.0, TLSv1.1 or TLSv1.2 (which is the default). NSExceptionRequiresForwardSecrecy (Boolean) - If NO the domain does not have to use a cipher with forward security. The default value is YES. NSExceptionAllowsInsecureHTTPLoads (Boolean) - If NO (the default) all communications with this domain must be in the HTTPS protocol. NSRequiresCertificateTransparency (Boolean) - If YES the domain’s Secure Sockets Layer (SSL) must include valid transparency data. The default value is NO. NSIncludesSubdomains (Boolean) - If YES these settings override all subdomains of this domain. The default value is NO. NSThirdPartyExceptionMinimumTLSVersion (String) - The TLS version used when the domain is a 3rd party service outside of the developer's control. NSThirdPartyExceptionRequiresForwardSecrecy (Boolean) - If YES a 3rd party domain requires forward secrecy. NSThirdPartyExceptionAllowsInsecureHTTPLoads (Boolean) - If YES the ATS will allow non-secure communication with 3rd party domains. While Apple highly suggests using the HTTPS protocol and secure communication to internet based information, there might be times that this isn't always possible. For example, if you are communicating with a 3rd party web service or using internet delivered ads in your app. Again, disabling ATS should only be used as a last resort, if switching to secure connections is either unavailable or impractical. This article has introduced App Transport Security (ATS) and described the way it enforces secure communications with the internet. 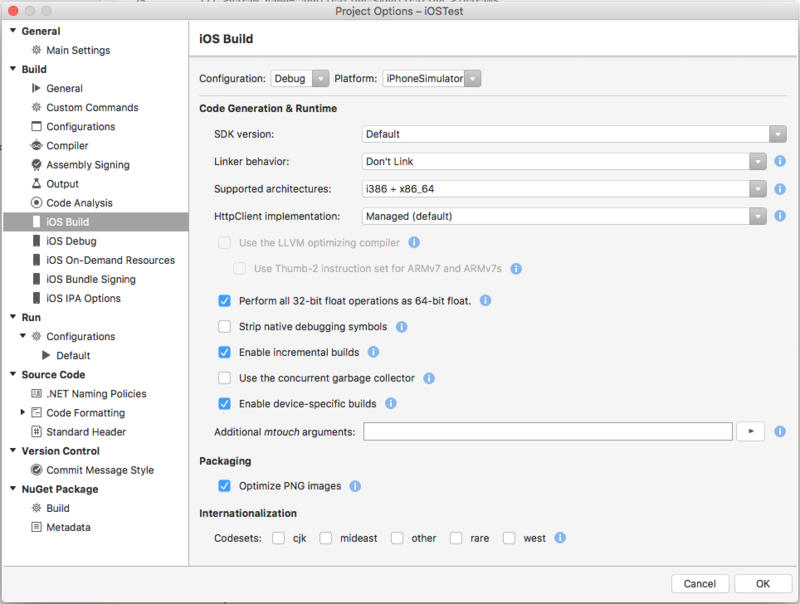 First, we covered the changes ATS requires for a Xamarin.iOS app running on iOS 9. Then we covered controlling ATS features and options. Finally, we covered opting out of ATS in your Xamarin.iOS app.